~A late March morning with an overcast sky brings you to one of the world’s largest flower gardens. You expect to see rainbow patterned fields of tulips waving at you because this has been the definitive symbol of Holland’s beautiful landscapes since ages. But that doesn’t happen because it is too early for the tulips to bloom in their full glory. 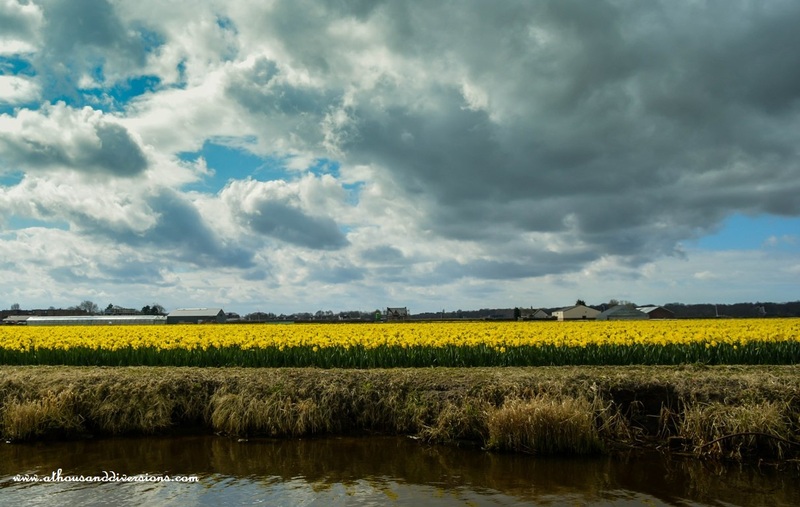 Yet, you marvel at what you see and rustle across the garden for those perfect clicks, before the approaching storm puts an end to your Keukenhof adventures. The sights and smells do not disappoint you. Indeed, they offer you the perfect antidote to the ‘canals & museums’ you have overdosed yourself with (in Amsterdam). You just wish the photographs could capture the scents of the flowers as well! 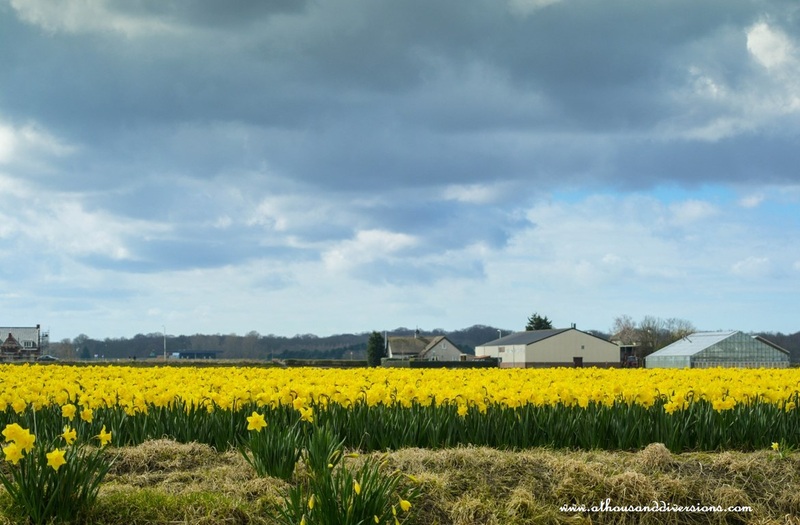 You pan your gaze, the vast filed behind the much-photographed windmill where the tulips should have been abloom are almost empty and irregularly covered by bright yellow daffodils. Beautiful, nevertheless. They say, there is a reason why the daffodils cannot grow along with other flowers. It’s probably far too special to be in the crowd. Most importantly, Daffodils announce the arrival of Spring. They say ‘Life isn’t a tiptoe through the tulips’ but,for a couple of hours, it was! 1. 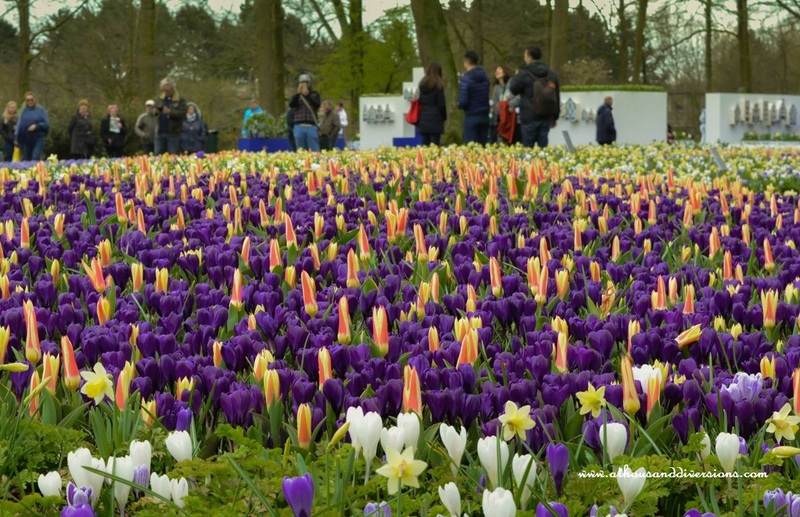 Each year, Keukenhof Garden opens in around mid-March and receives about more than 80 thousand visitors within 8 weeks before closing for the year. They redesign the park every year with different themes. This year marked the 67th opening of this ‘one of the must visit gardens’ in the world. When you look in awe at an approaching storm! 2. 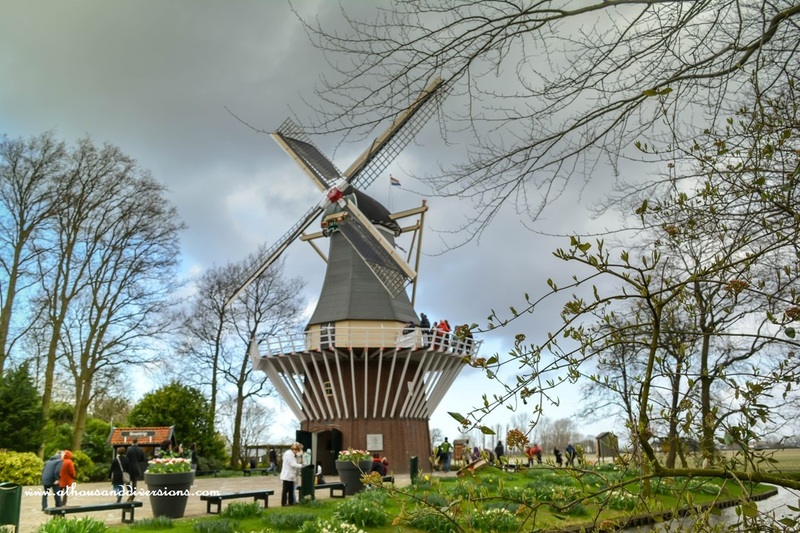 There is a windmill located inside the garden and one can go inside the mill to see how it functions. However, this mill is just for display puropses. If you want to see a real windmill and know how it works, Zaanse Schans is the place to be. 3. 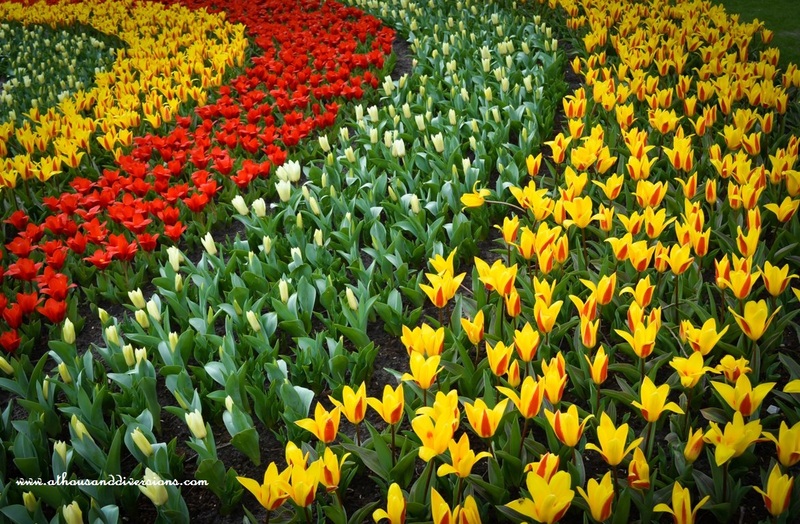 Keukenhof has beautiful winding paths for lazy walks and its surrounding areas can be explored by rented bicycles. There is also the provision of a 45-minute boat ride that takes one through the shallow canals across the vast tulip fields. 4. 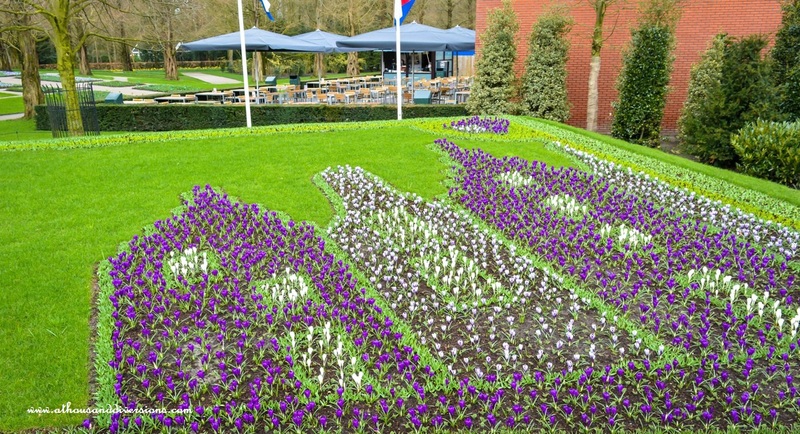 These long stretches of flower beds are not a part of Keukenhof and are mostly managed by private flower growers. But can be enjoyed through the boat ride which we recommend you to do only in Mid April. 5.These flame-like, dramatic patterns seen in the photograph (above) are the result of a tulip virus called mosaic carried by aphids. The same virus attacks lilies as well.The virus is definitely non-fatal but makes the plant weak. 6. 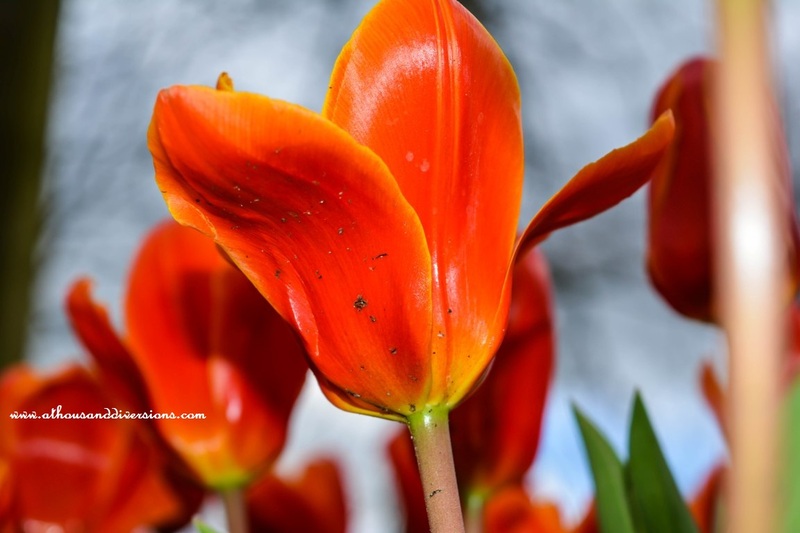 Have you ever heard of the phrase ‘The dutch tulip mania’? If not, check here for details of ‘how these flowers sent the entire nation into a frenzy during the dutch golden age (17th century)’. No wonder, it was once a status symbol of Holland’s wealthy population. 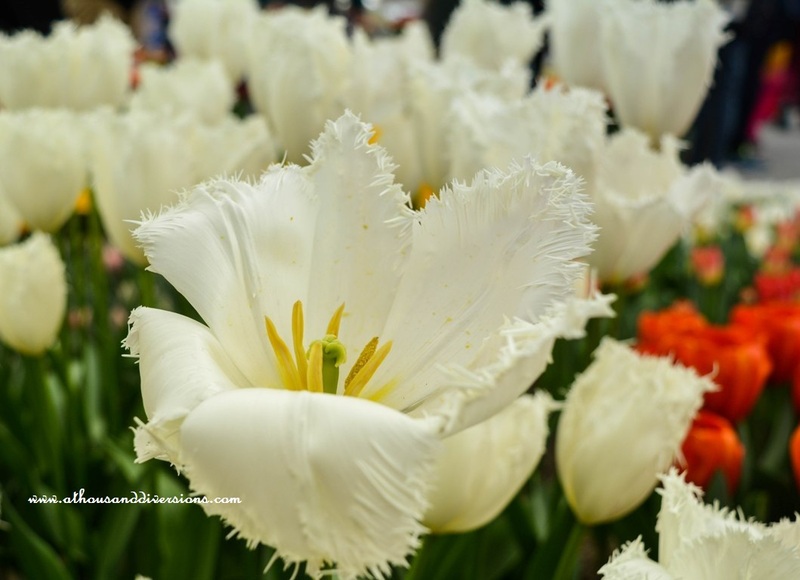 7.Apart from the vast stretches of flowers, Keukenhof has a number of indoor flower exhibition areas where one can witness great varieties of tulips, hyacinths, daffodils, orchids, lilies,roses, carnations, irises and several other spring flowers. 8. Although, Keukenhof is the most popular place to witness the tulip bloom, it is not the only place in Holland. 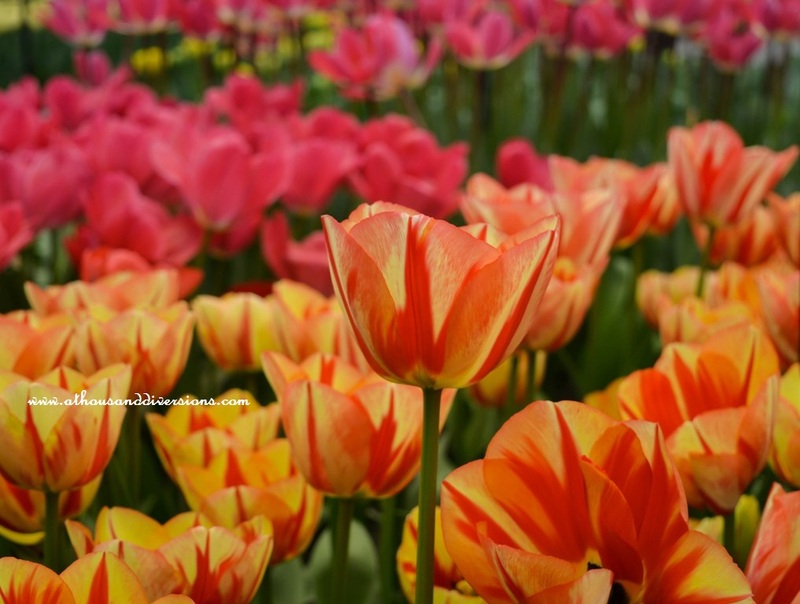 Holland’s longest and the most breathtaking tulip route is tucked in Flevoland where about 2500 acres of colourful tulip fields stretched over 100 km welcome you with wide open arms. 9. 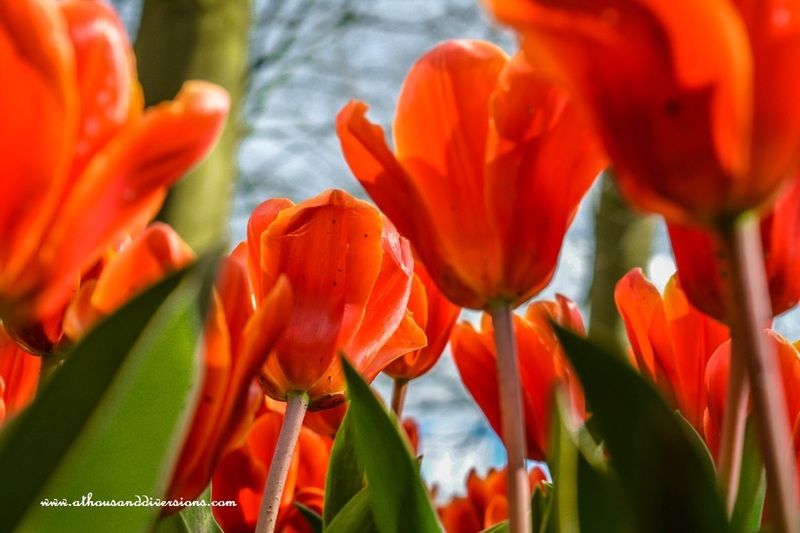 Keukenhof has restaurants and several food outlets for you to grab bites in between exploring different sides of the garden but the best way to enjoy it is to pack your own picnic basket and spread a treat amidst these beautiful blooms. No need to state the obvious but still- do not litter the garden. 10. 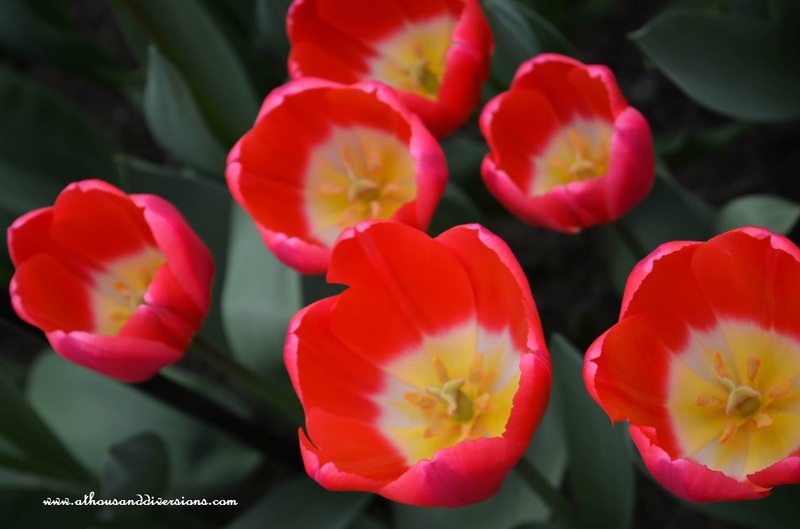 It can be a bit disappointing to miss the tulips in full bloom but you can always check the ‘weekly tulips & flowers updates’ to know details about the current bloom. First, the daffodils come out followed by the small tulips. The ones with big petals usually bloom in mid April. 11. This place is probably one of the most selfie friendly places in the world. I bet you wont be able to refrain yourself and why refrain? They have a special Selfie Garden made just for the selfie freak in you. There is no dearth of other fun activities and displays inside the garden. The best part is, most of them are free! Don’t blame me if this makes you giddy! 12. Oh, I almost forgot to mention, they have a small garden where you can sense 4 of the senses. You can’t eat or lick the flowers of course. Because, you are not a cow. And if possible skip the touching part as well. 13. Keukenhof claims to be the most beautiful Spring garden in the world. I don’t know about the others, but this is definitely one special place you got to visit once in your life for that extraordinary ‘visual & olfactory’ experience. 14. 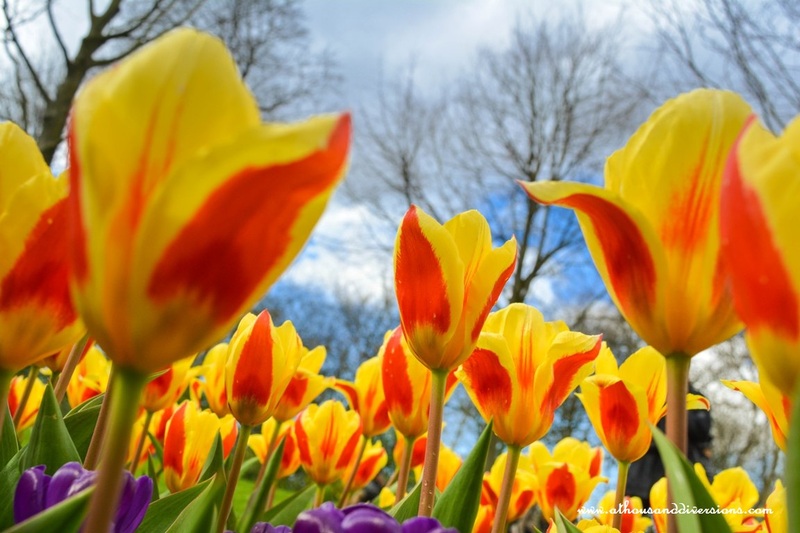 The theme of Keukenhof for 2016 is ‘The Dutch Golden Age’. You can see it in the photograph above. The bed of flowers is shaped to signify the period when the country flourished in trade and commerce as well as science and art.Incidentally, this was also the time when the tulip trade flourished in the region. 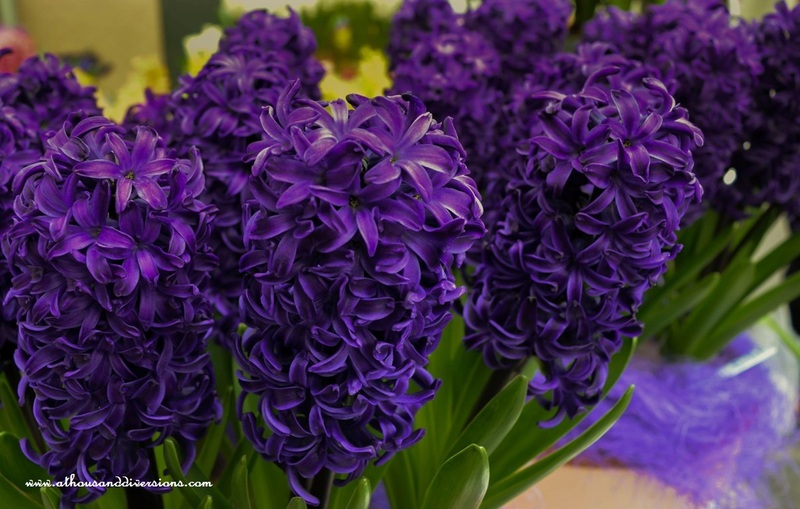 How to get to the park from Amsterdam: take bus line 197 (connexxion) to Schiphol Airport and then hop on to Keukenhof Express bus line 858. Buying a combi ticket online saves time and money. You can buy separate tickets. Just do the math. 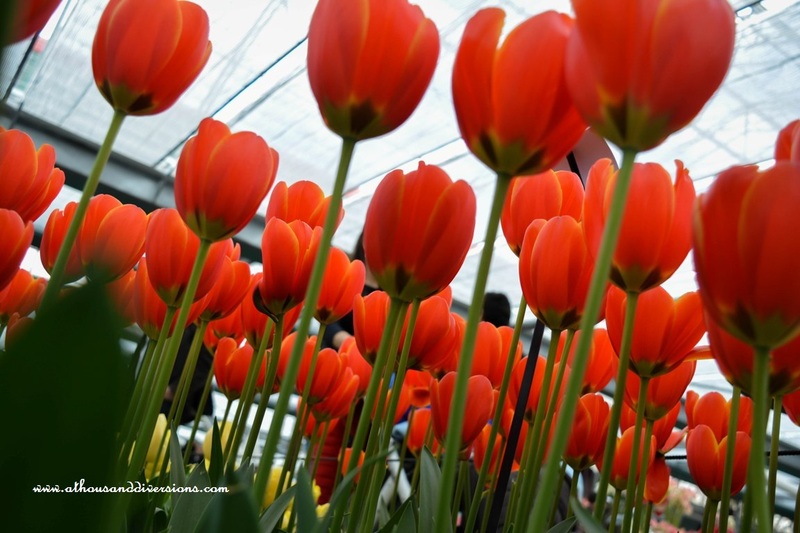 How to get to the park directly from Schiphol: Keukenhof Express bus line 858. The bus departs from Arrivals Hall near Exit 4. The Combiticket from the airport is for 24 euros. Where to stay: Keukenhof is located in Lisse, a quaint and 800 years old town in South of Holland. There are several options for accommodation in Lisse. However, most people make it a day trip from Amsterdam, Leiden or other nearby cities. Have you ever visit this place? Share your experience and photos with us in the comments section below. Brillant clicks! Vibrant colors… just awesome! Thanks a lot for reading. You are very kind with your words. Beautiful photos! I would like to visit the gardens in springtime one year.